More than 80 organizations compete for top honors in the 2016 SHN Architecture & Design Awards. This year's entries demonstrate the heightened competition across the sector. 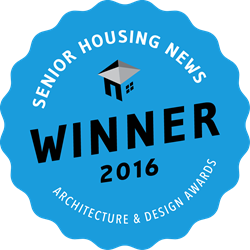 Senior Housing News, an Aging Media Network publication, is pleased to announce the winners of the 2016 Senior Housing News (SHN) Architecture & Design Awards. Senior living communities nationwide submitted their communities for consideration in the fourth annual SHN Awards, a contest that recognizes excellence by celebrating projects that improve the lives of seniors through innovative design. This year’s competition included the addition of two new project categories: Student Exhibition and International. "With advances in technology, operations and design, this year brought truly innovative projects to senior living. As residents become more selective, senior living owners and operators are looking to design as a differentiator,” said SHN Publisher and Founder George Yedinak. “This year’s entries demonstrate the heightened competition across the sector." From the more than 80 organizations that entered their communities in this year's competition, only nine projects were selected as 2016 SHN Architecture & Design Awards Winners for their unique approaches to senior living design. The competition evaluates communities through a scoring system that looks at various categories including design elements specific to each category, community integration, amenities and lifestyle features. The 2016 competition was sponsored exclusively by Kwalu, a provider of senior living furniture solutions to communities across the United States. “This year’s winners continue to demonstrate an incredible amount of innovative ideas in their respective categories to enhance the wellbeing of their residents. The Senior Housing News Architecture and Design Awards competition has continued to grow and expand over the years including this year’s two new categories," said Kwalu CEO Michael Zusman. Since the November 14 submission deadline, a panel of senior living industry experts analyzed each entry, basing their final judgements on several criteria including Design & Aesthetics, Community Integration and Amenities & Lifestyle. The Senior Housing News Architecture & Design Awards recognizes cutting-edge design, excellence and innovation in senior living. Returning for its fourth year, the annual awards contest celebrates unique projects and companies that are improving the lives of seniors through innovative design. Visit http://www.shnawards.com for more information about this year's contest, as well as past winners. Aging Media Network is an innovative publishing company based in Chicago, IL, and is the publisher of Senior Housing News, Reverse Mortgage Daily and Home Health Care News. Senior Housing News is the leading independent source for news and information covering senior housing and senior living. With a global reach of more than 30,000 industry professionals, SHN's audience includes senior housing operators, developers, banking institutions, real estate investment trusts, private equity and service providers catering to the industry. Visit http://www.seniorhousingnews.com for more information. Kwalu is the leading provider of furniture to senior living in the U.S. Its products are Designed to Last® and will continue to look like new, year after year — which is so important right now, given the trend of residents' rising acuity levels and the resultant ongoing beating the furniture takes from walkers, wheelchairs and the like. When attracting new residents and maintaining high satisfaction levels for existing residents is important, Kwalu's senior living furniture can make the difference.